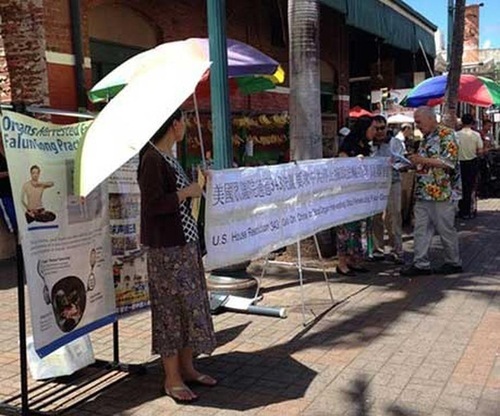 Local Falun Gong practitioners arranged a series of events in Honolulu’s Chinatown on June 18 and 19. The goal was to raise awareness about the persecution of Falun Gong in China, that has now gone on for 17 years. People ask to learn more. They also talked to people about US Congressional House Resolution 343. 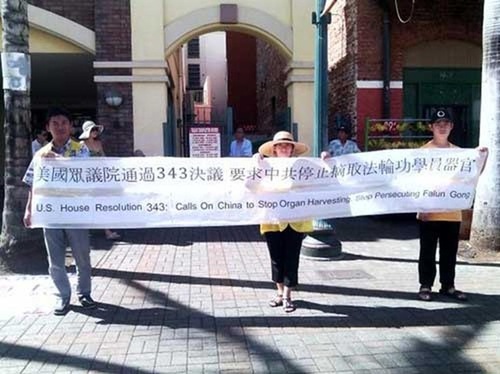 The resolution was passed in mid-June, and calls for China’s communist regime to immediately stop forced organ harvesting from Falun Gong practitioners and other prisoners of conscience. The resolution also calls for an immediate end to the persecution of Falun Gong and the release of all incarcerated Falun Gong practitioners and other prisoners of conscience and a credible, transparent, and independent investigation into China’s organ transplantation system. Falun Gong practitioners unfolded a large banner about the House Resolution and distributed flyers in both English and Chinese. They plan to continue this activity in the next four weekends. Falun Gong practitioners in Honolulu hold a large banner in Chinatown. 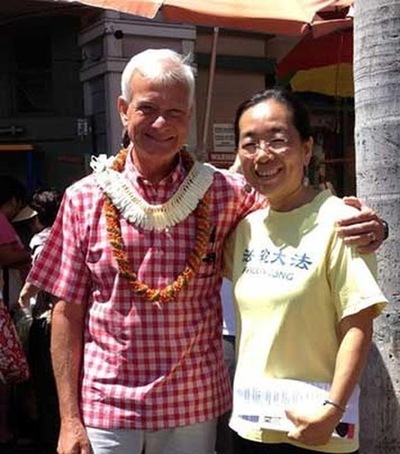 Mr. Caldwell, Mayor of Honolulu, and other city officials, happened to be inspecting Chinatown. They had the opportunity to learn more about Falun Gong and expressed their support of practitioners’ tireless efforts to help stop the persecution. Several local Chinese commented that the CCP was doomed and that the Chinese people had stopped believing in communism.